Manfred did sound hopeful that owners and players can agree to changes to pace-of-play rules before the first pitch of the season is thrown. 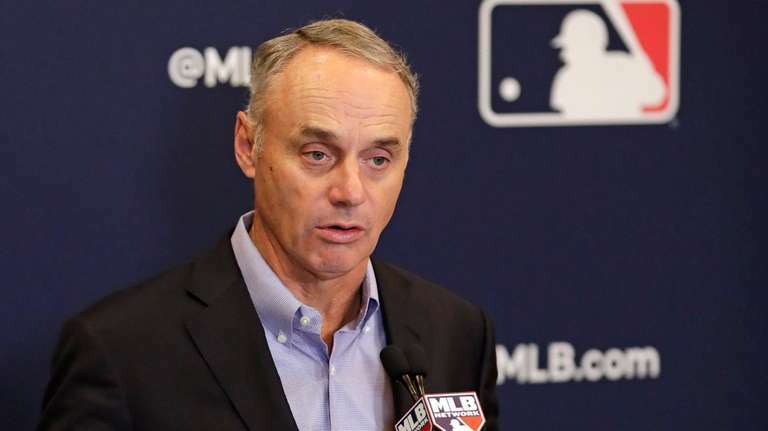 ORLANDO, Fla. — Commissioner Rob Manfred on Friday all but ruled out bringing the designated hitter to the National League in time for the 2019 season, saying “the clock’s kind of ticking” on making such a momentous change before Opening Day. But Manfred did sound hopeful that owners and players can agree to changes to pace-of-play rules before the first pitch of the season is thrown. Major League Baseball sent the Players Association a pace-of-play proposal in January that included items such as a 20-second pitch clock and a three-batter minimum for relievers. The union, which is led by former player Tony Clark, countered with a much more extensive proposal that included economic issues, such as changes to calculating service time and the amateur draft. The owners consider adding the DH to the National League an economic issue because the DH can be a high-salaried position. The collective-bargaining agreement between the owners and players runs through 2021, but Manfred said he is willing to discuss the union’s proposals in time. Manfred explained the thinking behind the radical proposal to require relievers to face at least three batters (unless it’s the end of the inning or the pitcher is injured). With spring training set to open next week, two of baseball’s biggest stars in Bryce Harper and Manny Machado remain free agents. It’s an embarrassing situation for baseball and one that Manfred hopes will be settled soon.